Strangely enough we met a dog coming down the 18th of december when we were going up the Vacas valley. 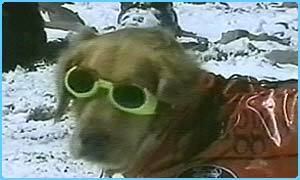 His companions told us that this dog had summited, but all news sources like the BBC vbelow only mention another dog/summit. Rubia the golden retriever has boldly gone where no dog's been before. The two-year-old pooch has just climbed the highest peak in Latin America - Argentina's 7,000-metre Aconcagua. She had been training for the feat since she was seven months old and was accompanied by two humans, who were really impressed by her performance. Rubia was kitted out with jackets and boots for the challenge, which had a serious purpose in checking out how rescue dogs operate at great heights. Rubia was roped to one of her companions throughout the climb. She was fed a special diet and had cream rubbed into her paws to prevent injuries. "The dog would react and recover better than we would," said one of Rubia's fellow climbers. What do ya reckon? Was that a load of porky pies or did he do it i wonder? Anybody know a group of Americans coming down Acon (Vacas Valley, polish traverse, no summit) around the 20th December? Hey MoT, yep, that's what I meant with my first sentence in the first post. Sorry, didn't even look at your post! - had actually seen the article somewhere else and just presumed you were commenting on it! I thought that this article was going to refer to the dog that I saw on the Canaletta on January 17, 2004. While I did not see the dog ON the summit, the greyhound-type animal was coming down the Canaleta alone on the boot track to the side, as we were going up. He was looking toward the centre of the slope however, as if searching for the owner. Anyone else see this high-altitude hound? Now you saw a dog the 17th in the Canaleta, but was it a different one than the one in the picture/on the news? I think we have to check the summitlog for pawprints!